Advanced technology, solvent and odor free elastomeric sealant and adhesive. Available in 10 selected wood colors that do not discolor over time. Adheres to any type of wood without priming, creating a seamless and flexible seal. It remains unaffected by moisture. Suitable for filling the openings between wood skirting and wood floor joints. It seals the joints between floor boards resulting from time related wear. It also seals the joints occurring from the installation of dissimilar materials with wood, such as marble and stone, as well as ceramic tiles etc. 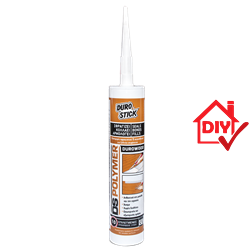 Ideal for installing wood moldings around doors and windows as well as ceilings, therefore avoiding nailing. Indicatively, one 340gr cartridge fills 8.6 linear meters of a 6x6mm joint.